We love the tradition that Thanksgiving brings — a time to give thanks for all of life’s blessings and share it with those around us. 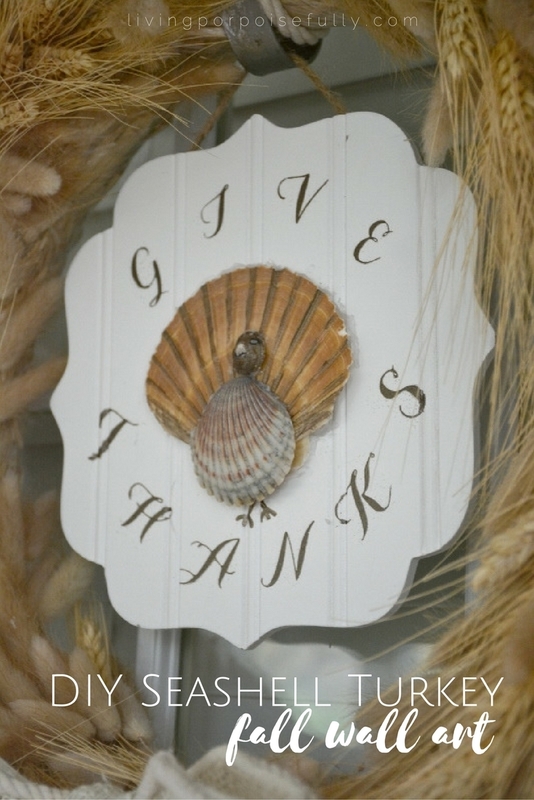 To mark the tradition, we made a simple beadboard sign reminding us to give thanks, coastal style of course! Our conch-ucopia will be a fitting centerpiece for our table, but something to hang on our door would be a wonderful reminder every time we enter. So to make it true to our coastal hearts, we used seashells to form in the shape of a turkey. We raided our seashell collection, searching for just the perfect sizes and shapes. Here’s how we made it! Then we removed the silkscreens and rinsed them off right away. We applied hot glue to the medium scallop shell and limpet to attach to the large scallop shell, and then the large scallop shell to the beadboard. We tried several combinations of seashells, some that looked far from resembling a turkey! We decided to paint the raised ridges of the large scallop shell, and feet in at the bottom with the brown metallic paint. We also painted the limpet shell, and left white in the shape of the beak. It’s a little hard to see in the picture, but we decided to add eyes in with black and silver sharpie markers to complete the turkey. We put the finished sign in the center of the “sea oats” (wheat) and nautical rope wreath that we made earlier this fall! It will be a wonderful reminder to “give thanks” for all of the blessings in our lives. We hope you have an abundantly thankful Thanksgiving, and as always, live porpoisefully! This is fabulous! What a creative way to include a coastal look for fall. The turkey is just adorable.